Press tofu between paper towels to absorb excess moisture. Set aside. Heat 12-inch nonstick skillet or large wok over medium-high heat. Add peanut oil to pan; swirl to cover bottom. When oil is hot, add tofu. Cook 3 to 4 minutes, stirring occasionally, just until light golden brown. Remove tofu from skillet. Working quickly, add garlic and gingerroot; stir. Add peas and carrot; stir. Add mushrooms. Cook 3 to 5 minutes, stirring constantly, until mushrooms begin to brown. Add kale. Cook about 2 minutes, stirring constantly until kale wilts. Add tofu, sesame oil, soy sauce and fish sauce. Stir to thoroughly coat. Serve over rice. 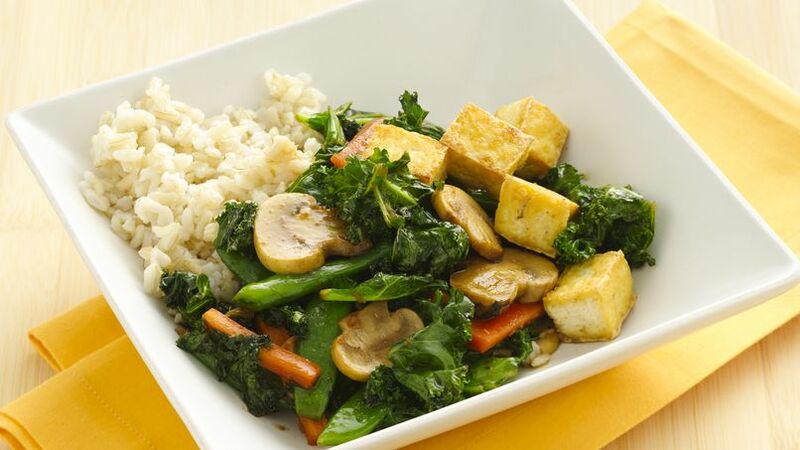 To save time, cut tofu and prep the vegetables the day ahead; stir-fry when ready to serve. Stir-fry is a wonderful, quick-cooking technique that brings out the best in fresh vegetables. Try this dish starring kale, sugar snap peas, carrots and mushrooms.